Now a new opportunity to increase access to bicycling for Ihe and his neighbors is coming by way of the Bike Repair Hub. The Hub will provide affordable repairs, free advice, and will act as a hub for all sorts of cycling activities. The Hub is currently being designed collaboratively and on an accelerated timeline by New Columbia residents, Community Cycling Center, Home Forward staff, and MFA students from the Oregon College of Art & Craft and Pacific Northwest College of Art. It will be completed by August 31st! In just a few weeks, New Columbia will have its own Bike Repair Hub, but we need your help to help us cross the finish line. The Bike Gallery, the Community Cycling Center and hundreds of supporters are coming together. We invite you to join us – become a part of this project by making a donation today. For every $2 you give, the Bike Gallery will contribute $1 to the New Columbia Bike Repair Hub. 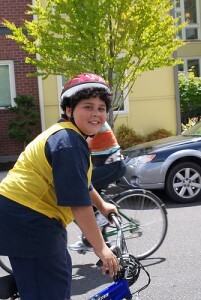 Help us reach our goal of $10,000 by September 5th and help empower more riders like Ihe.